Justin Gray built his first RC car at age seven and picked up his first welding torch at age sixteen. An apprenticeship with renowned sculptor Martin Metal shaped Justin’s esthetics in patina and metal sculpture. Justin soon co-founded fire sculpture group Therm. 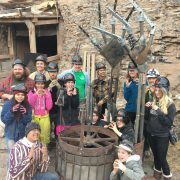 This underground group built wild and complex fire sculpture and presented it internationally, pushing the envelope of audacious art and performance. Legendary large-scale machine performance group Survival Research Labs soon captured Justin’s interest, and he joined this group of like-minded techno-destructionists in 2006. Justin’s obsession with radio control also thrived, leading him to protype and build his first electric vehicle in 2000. Justin continued building custom electric vehicles for future-thinking clients looking to gain a foothold in the burgeoning electric vehicle industry, and continues this work today. It was only a matter of time before Justin’s passions converged and his resulting fleet of electric drive radio controlled fire sculpture robots are uniquely powerful, savage, and beautiful. 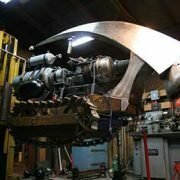 Justin’s robots share his shop with Graywrx Fabrication, a fully tooled machining and fabrication shop, where his broad range of abilities and limitless imagination enable Justin to engineer solutions to even the unlikeliest challenges posed by his exacting clientele. Electric vehicle design and fabrication, prototyping, metal fabrication, robotic systems design and build, special effects (fire and robots), precision machining including mill and lathe work, hydraulic systems design and repair. This January 20-22, Festival goers will be entertained by dancing fire spinners and towering fiery art in Telluride Mountain Village, and also be captivated by larger-than-life fire installations on the Telluride Ski Resort, atop the gondola. Local fire artist and architect, Anton Viditz-Ward will have his magnificent Fire Spinner on the ski slope. Guests attending the Saturday night Fire Ball will have the opportunity to view his interactive fire installation as well as other fire sculptures on a backdrop of glistening snow, 10,000 feet above sea level. The Festival honors many artists whose works of fire art can often only be witnessed at Burning Man in the Nevada desert of Black Rock City. The annual Telluride Fire Festival begins January 20 with fire performances and fire art installations in Telluride’s Mountain Village, 5-8pm Friday, Saturday and Sunday nights. The outdoor experiences are offered are free to all. Saturday night will feature the wildly outrageous Fire Ball in North America’s highest (one-night-only) nightclub at 10,535 feet on St Sophia Ridge. This event will wow all with music, fire performers, aerial silk spinners, jugglers, cash bar, yummy food, and more. Master welder, artist and architect, Anton works his magic in an abandoned mine just outside of Telluride, which he uses as both a studio and starkly minimalist backdrop for creating and showcasing his spectacular, fiery creations. Working with heavy steel on a large scale, Anton constructs three-story tall “creatures” that he loads with wood, torches and spins via man-powered axles—remarkable to witness in person. Anton has received many grants over the years from Burning Man to bring his art to the desert. Renowned Burning Man photographer Scott London will be hosted at the Telluride Gallery of Fine art with a kick-off reception Thursday, Jan. 19. Scott is a photographer and journalist based in southern California. His photographs have been widely published, appearing in books, newspapers and magazines in more than 30 countries. Publications include Rolling Stone, Vanity Fair, Newsweek, The Atlantic, Wired, Fast Company, GQ, Architectural Digest and National Geographic Traveler. His work has also been exhibited across the U.S. and Europe. Highlights include the “Living” exhibition at the Louisiana Museum of Modern Art in Denmark and the “Art in an Ephemeral Age” show at the Institute of Art and Ideas in England. His book Burning Man: Art on Fire will be featured at Between the Covers bookstore and Scott will sign books at the reception. The Festival’s current sponsors include AmeriGas, Hotel Telluride, Lumière Telluride, Madeline Hotel & Residences, Scott’s Printing, Telluride Ski Resort, Telluride Mountain Village Owners Association, CCAASE, and The Victorian Inn. The smell of propane wafted from a long metal tube as Max Ewy flicked a lighter over small drill holes, igniting the apparatus in a long line of short flames. Ewy rushed around the tube to queue punk music, sent through a speaker at one end of the cylinder. As the sounds of The Damned blared, the flames danced along with the beat. Part science, part art, Ewy’s Ruben’s tube, as it’s called, jumped to life in a swirl of sound and sight. 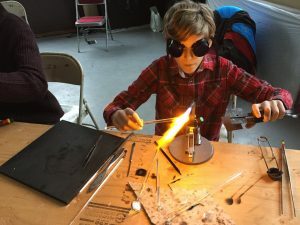 The first project of its kind for the 15-year-old artist and costume designer, the “standing wave flame tube” has been selected to highlight the second annual Telluride Fire Festival, Jan. 14-17. The idea for creating the Ruben’s tube came from a YouTube video. And after learning of the Fire Festival, Ewy was encouraged to produce the apparatus for the event.